The life of Jesus Christ has enamored Christians from the earliest days. While we don’t know a lot about His hidden years growing up in Nazareth, and then working as a carpenter, yet every aspect of His life and all the events of His life fascinate us and draw us deeper into the mystery of His Person and mission. St Francis of Assisi (1182 -1226) one Christmas to construct a manger and re-enact the Christmas story. The focal point of his devotional creation was the little newborn baby Jesus – an act of tender devotion by a loving disciple. 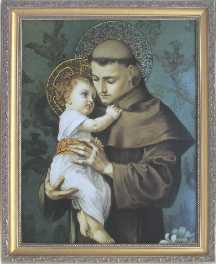 A contemporary of Francis’ – and another Franciscan – St. Anthony of Padua (1195-1231), whose feast day is today, is almost always portrayed in paintings and sculptures holding the small Christ Child and looking intently at His face. This portrayal is based on an actual event that was witnessed by a friend of Anthony’s one evening. What drew the mystic Francis (who had received the stigmata) and this Doctor of the Church, Anthony, to the baby Jesus? The great St. Teresa of Avila (another reformer of the Church, like Francis) had a devotion to the Christ Child also and in each of the many convents which she founded she placed a statue of the Christ Child. What drew this sixteenth century saint to this young Child? Do we not find Christ in His utter simplicity and lowliness when we see Him as a Child? But also, He is God approachable – as in the crib – who can fear God as newborn baby? Who would not be able to draw near to God in His “helplessness”, His weakness, His poverty, His innocent childlike revelation of Himself? Jesus as a baby and infant calls the world to Himself – we can whisper something to Him and even be playful with Him. Certainly, this is part of the message of St. Therese of Lisieux (1873-1897) also known as Theresa of the Child Jesus. From her own childhood she was attracted to the Child Jesus. She wrote to Him, drew pictures for Him and learned spiritual lessons from Him. Even in her early adult years (she died at the age of 24) she often thought of Christ (and her own life) in the simplest childlike terms. She called her path to God and Heaven “her little way”. And in the last century the Church weighed in on this “little way” – naming her Doctor of the Church (like her namesake Teresa of Avila). As you can see the Church has had a rich tradition through the centuries of devotion to the Christ Child. Devotion to the Unborn Christ Child is simply an extension of devotion to the (born) Christ Child. Given the reality of abortion-on-demand, we think it is important for the Church to discover the solidarity established between Unborn Jesus and every unborn child, especially those unborn infants at risk.